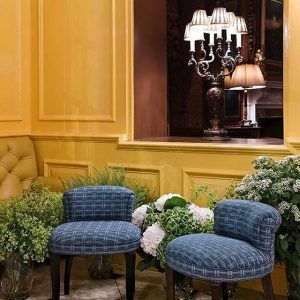 As part of Gainsborough’s brand-new fabric launch at this year’s FOCUS event and also in celebration of their 115th anniversary, we were thrilled to support them with the supply of our stylish Weston Armchair and charming Charlie Stools. Our dedicated team of upholsterers had two of the three new ground-breaking fabrics to use on the Weston and two Charlie’s. 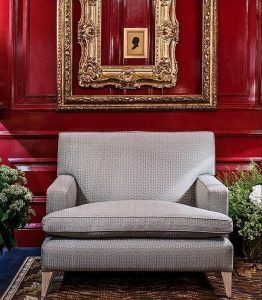 The Weston was covered in Gainsborough’s Taylor Criterion II (3549/11459) fabric as shown below and the two Charlie Stools were upholstered in Tenzing Sky Blue/Slate 3544/11478, both showcased at this year’s FOCUS event at Chelsea Harbour, London. 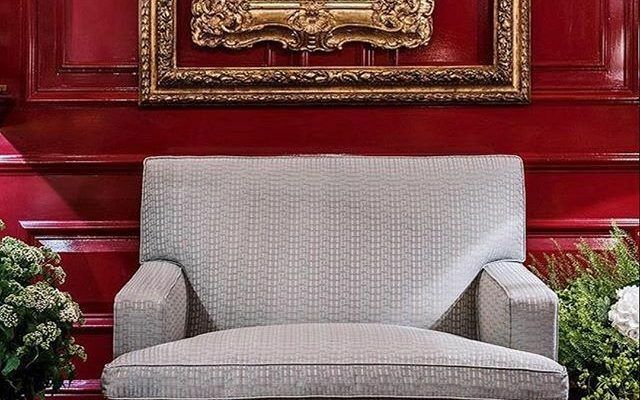 This brand-new collection has been promoted by Gainsborough to enable them to offer designers and specifiers the best of both worlds, including the integrity and beauty of their versatile fabric ranges at attractive price points to bring into their entire drapery and upholstery design schemes. We were thrilled to have our pieces photographed in the wonderful and historical Goring Hotel which officially opened on the 2nd March 1910. This hotel was built by Jeremy Gorings’s great-grandfather Otto in 1910 and has been lovingly run by the Goring family ever since. A hotel which is widely believed to be the world’s first hotel with en suite facilities and central heating in each and every bedroom! A great place to house both our Weston Armchair and Charlie Stools. We always love to see our handmade pieces in great historical venues such as The Goring Hotel. If you would like to enquire about any of the pieces mentioned above, please email jessica@theoddchaircompany.com.